Sir Mark Justin Lyall Grant, GCMG (born 29 May 1956) is a former senior British diplomat who was previously the United Kingdom's National Security Adviser and Permanent Representative of the United Kingdom to the United Nations. Born in Hammersmith to Mary (née Moore) and Ian Lyall Grant, Grant was educated at Eton College and read law at Trinity College, Cambridge. He was called to the bar at Middle Temple, London before deciding to join the Foreign and Commonwealth Office in 1980. His wife, Sheila, is also a diplomat. In April 2012, Lady Lyall Grant, with Huberta von Voss Wittig, made a video appeal to Asma al-Assad, calling on the Syrian first lady to take a stand against violence in her country. The Lyall Grants have a son and a daughter. Lyall Grant enjoys in his spare time a spot of golf, tennis, or bridge. 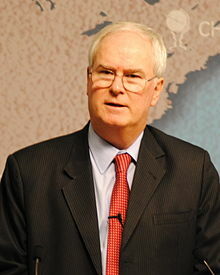 Lyall Grant was British Permanent Representative to the United Nations (UN) from 2009 to 2015. He held the office of President of the United Nations Security Council four times, during the months of November 2010, March 2012, June 2013, and August 2014. Lyall Grant was appointed a Companion of the Order of St Michael and St George (CMG) in the 2003 New Year Honours before being promoted to Knight Commander (KCMG) in the 2006 Birthday Honours and a Knight Grand Cross in the 2018 New Year Honours. On 7 July 2015, Number 10 announced that Sir Mark would replace Sir Kim Darroch as the United Kingdom's National Security Advisor on 7 September 2015, with Darroch moving to a different diplomatic post. As of September 2015, Lyall Grant was paid a salary of between £160,000 and £164,999, making him one of the 328 most highly paid people in the British public sector at that time. On 27 February 2017 it was announced that Lyall Grant will retire in April and be replaced by the Home Office Permanent Secretary Mark Sedwill. ^ a b ukun.fco.gov.uk: "Permanent Representative - Sir Mark Lyall Grant"
^ "No. 56797". The London Gazette (Supplement). 31 December 2002. p. 3. ^ "No. 58014". The London Gazette (Supplement). 17 June 2006. p. 3. ^ "No. 62150". The London Gazette (Supplement). 30 December 2017. p. 4. ^ "National Security Adviser appointment: Sir Mark Lyall-Grant - Press releases - GOV.UK". www.gov.uk. Retrieved 8 July 2015. ^ "Senior officials 'high earners' salaries as at 30 September 2015 - GOV.UK". www.gov.uk. 17 December 2015. Retrieved 28 February 2016. ^ "Cabinet office: new senior appointments and changes - GOV.UK". www.gov.uk. Retrieved 5 March 2017. This page was last edited on 28 November 2018, at 07:21 (UTC).